Guest Post by Joe Tomino, drummer for Matisyahu and Drub Trio. On my fifth trip to Israel I made it my mission get my hummus on. 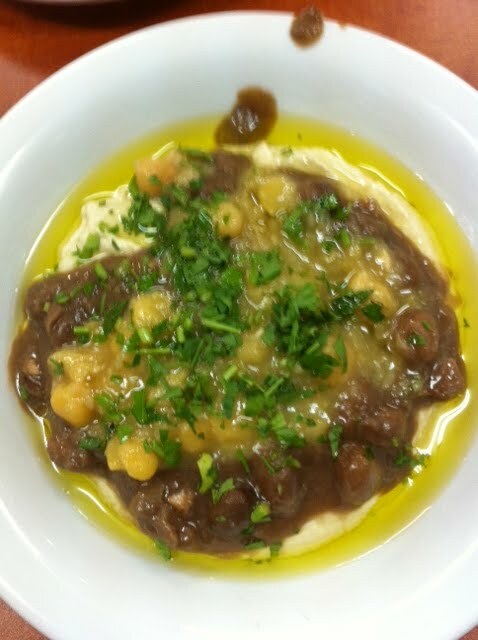 I decided I would sample some of the hummus I’ve had on previous trips and indulge in a few newcomers…at least to me. My journey began in Tel Aviv and upon arriving at the hotel, i was ready for action. Only a ten minute walk from the hotel I arrived at Mashawsha. I ordered hummus ful straight up. Ten minutes later it arrived table side. It smelled delicious and looked good too. 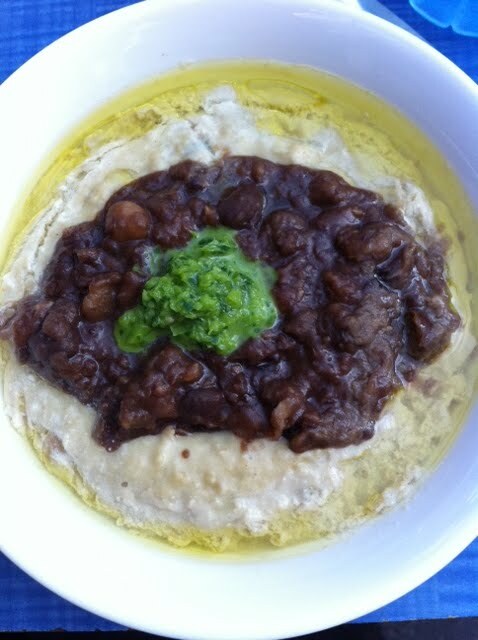 A simple presentation of beans (chickpea and fava), parsley puree with a golden rim of olive oil was perfect. The hummus was piping hot and perfectly balanced. It was exactly what I needed after traveling 14 hours and not eating a proper meal. I didn’t want to do anything but take a nap after indulging. I was taken to Ha-Suri by some local friends. We arrived with a large group and sat outside in the blazing heat while waited patiently for our hummus. I ordered a lemonade, the quintessential compliment (other might argue a bottle of Coke or beer), to a bowl of hummus. I had a great view of the man in action as he made my bowl of goodness. Assembling this concoction was like second nature for this gentleman as he began with a ladel of chickpeas, drizzle of tahini, dollop of broad beans, spalsh of lemon juice and olive oil, sliced egg, and finished with a dash of paprika. This hummus looked like a work of abstract expressionist art. The dish was surprisingly light and a perfect portion size for an afternoon snack. Before heading over to the soundcheck, the promoters decided to take us out for a quick hummus. 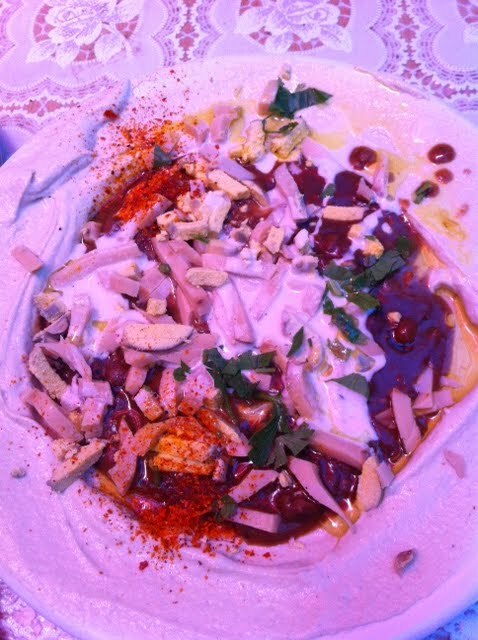 This was to be my first hummus masabacha experience. This was one well seasoned hummus….complete with healthy doses of paprika, cumin, black pepper, chopped parsley, lemon juice, tahini, and olive oil. The lemon juice was a really nice complement to all the spices. Topped off with a whole sliced egg and served along side whole jalapeños, onion wedges, and pickles, this meal was FILLING! 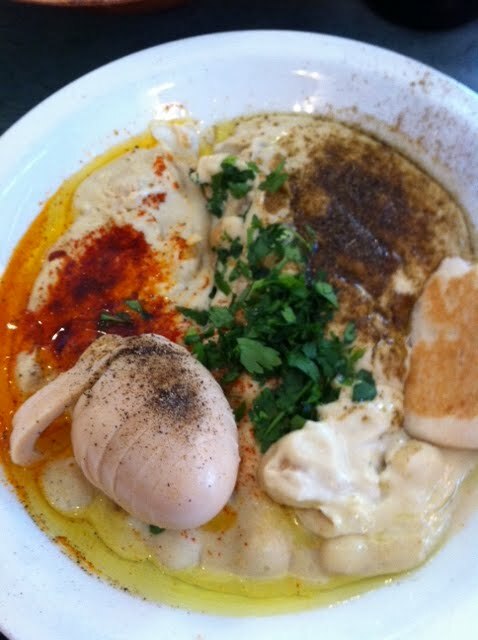 Within 30 minutes of my first arrival in Tel Aviv, in 2004, Abu Hassan was the first Israeli hummus I’d ever consumed. I remembered it being quite an experience. Located in Jaffa, this place is slammed with locals, cab drivers, and a wait staff who scream orders at the top of their lungs…it reminds me of NYC in some ways. While the decor has cleaned up a bit, I think there was some renovations, this place hasn’t changed a bit. The hummus here is time-honored. What I really love about this place, aside from the atmosphere, is the accompanying garnish (a mix of lemon juice, garlic, and finely diced jalapeños). I must admit the hummus was a little under salted, but once i poured this simple garnish atop the mix of hummus ful and masabacha, it was perfect. Washed down with some lemonade….cue nostalgia. 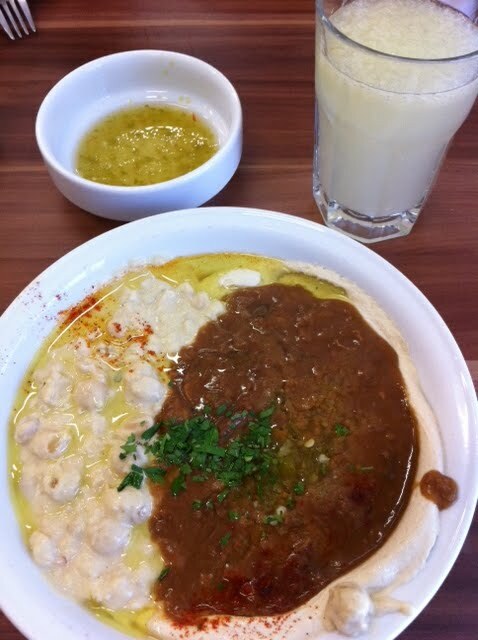 After wondering around the narrow market streets of the old city in Jerusalem, I finally found Hummus Lena (a humble establishment with four or so tables). This was my first hummus in Jerusalem. After waiting patiently, with a good view of the hummus being assembled, I was ready to indulge. The serving size was smaller than most that i’ve had. The looked was nicely layered with an aura of golden hue. A mixture of pureed chickpeas, crushed whole beans (chickpea and fava), a heavy pour of oil, and a light drizzle of lemon juice…it tasted AMAZING. this was some of the best olive oil i’d ever had…seriously unctuous stuff. There once was a man who was having a conference about a crisis affecting Israel. He had a friend named Ami that he wanted to invite to speak. There happened to be another man in town named Bar Ami that he had terrible disagreements with over almost every issue concerning Israel. His assistant started sending out invitations to speakers and mistakenly sent out an invite to Bar Ami. Meanwhile, Bar Ami got the invite and thought that the other man had a change of heart and wanted to initiate dialogue. So he went to the Israel conference and prepared to speak. The host of the event saw that Bar Ami was going to be next at the podium and flew into a rage. He personally went over to Bar Ami and started to kick him out of the conference. Bar Ami tried to reason with him that he would be very embarrassed if he were dis-invited. However, the host didn’t back down. Bar Ami then offered to sponsor part of the conference. The organizer told him that he didn’t need his money or sponsorship. And so the host kicked Bar Ami out of the conference. Bar Ami saw that there were all kinds of Israel supporters at the conference, even prominent ones. None of them stood up to speak-out when the host was kicking him out. “It must be,” reasoned Bar Ami, “that the participants all sided with the host.” So Bar Ami decided to retaliate. He went to the offices of a senator running to be president, and told him that the Jews were planning on working against him. The Senator did not believe him. Bar Ami told him to go to Israel and place a letter in the Kotel and see if the Jews respected his privacy, thereby showing their respect to him. The Senator agreed and went to Jerusalem. Bar Ami had suspicions that the note would be made public and that the Senator would not be respected or worse. The decision by the newspaper to make the note public on Friday drew criticism. The rabbi in charge of the Western Wall, said that publishing the note intruded in the future relationship with God. “The notes placed between the stones of the Western Wall are between a person and his maker. It is forbidden to read them or make any use of them,” he told the journalists. The publication “damages the Western Wall and damages the personal, deep part of every one of us that we keep to ourselves,” he said. A rival newspaper claimed they had been approached to publish it and had decided against it to preserve the Senator’s privacy. Bar Ami was successful at persuading the Senator that the conference of Israel supporters and even Israel were working against him. When the senator was elected President, he appointed Bar Ami as his trusted advisor on Israel, much to the dismay of the organizers of the Israel conference which had booted Bar Ami. The President immediately called on Israel to unilaterally advance the “peace process,” and refused to meet with the Israeli leader. The President now felt that the Israeli Prime Minister was an unwilling partner to his vision of a peaceful middle east. Leaders in Israel squabbled about whether their Prime Minister had sabotaged good relations with the USA, and as a siege of Israel began, both sides dug in their heels. The political siege of Israel began to weaken Israel’s ability to conduct its affairs. Israel’s ministers and generals were prevented from travel abroad for fear of arrest. Boycotts of Israel, Israeli culture and Israeli products around the world began in earnest. Israel’s enemies tightened the siege, accusing Israel of war-crimes, genocide, apartheid, and any other crime that they could think of. The few friendly Muslim nations began to undo the friendship. Meanwhile, vindicated against the other conference, Bar Ami started his own Israel conference. His conference, he proclaimed, was for peace, and had the stamp of approval of the President. People flocked to hear him. He garnered support from senators and congressmen, from rabbis and heads of large Jewish organizations. He took out expensive ads around the country critical of Israel, and the other Israel conference. He was invited to exclusive meetings at the White House and quoted in newspapers and on TV. He published op-eds and established offices around the country, and on college campuses. However, soon it became apparent to supporters in congress and around the country that Bar Ami was more of a liability than an asset. His rhetoric seemed to line-up with the rhetoric of those waging the siege against Israel. Bar Ami’s standing with the President began to fade, and his conference drifted further and further to the middle, trying to stake out positions proved their were still pro-Israel. The President, realizing that he lost support of the other Israel conference, and the community of Israel supporters, started to reexamine his own stance towards the Israeli Prime Minister, hoping to gain their allegiance. Bar Ami’s conference it was discovered had been funded by well known critics and enemies of Israel. He denied it at first, but then it was discovered that major funding came from dubious sources. Bar Ami lost more and more support even from his advisers and financial backers. His influence withered and he was no longer welcome in the halls of the great President. The Siege of Israel meanwhile tightened. International activists set out to breach Israel’s borders, delivering aid to Israel’s enemies. Israel botched the defensive raid, and further added to her international isolation. As the isolation tightened, divisions within Israel grew stronger between those who believed Israel should unilaterally create a new state on their borders, and those who argued for the status-quo. The animosity kept the reining Prime Minister in office even after hundreds of thousands marched in the street against his government. The President decided to forgo both the advice of either conference, and forge his own way, continuing to alienate them both, the Israeli public, and supporters of Israel. All the nations major opinion makers aligned against him, except for the New Amsterdam Times. The Times published critical op-eds of Israel and laying the failure of a peaceful future at her doorstep. In Israel, the Prime Minister began to make concessions to maintain his position. He appointed advisers to sort out the internal mess of no housing. He hired outside consultants to help break the political siege. Those maintaining the siege were handed another political victory as they could portray that Israelis were more concerned about their own expensive housing, then they were of the Palestinians whose homes they were supposedly wrecking. Soon Bar Ami’s conference was disbanded, torn apart by internal struggles between far leftists and centrists. The other conference grew more powerful than before, and teamed up with other gentile conferences all trying to aid the besieged nation of Israel. The President was reelected after defeating a former governor from Alaska. He made a trip to the middle east and spoke more about peace and democracy, as democratic reforms soon gave way to Islamist regimes. Israel elected a new prime minister who promised to end the siege. The siege continued to get worse and worse, causing all but the staunchest supporters to withdraw their support for fear of siding with the enemy of peace. The boycotts worsened. The hatred of Israel grew and spread from college campuses into mainstream life, and Israel became a pariah of the nations. Then a prophet arose in Israel who proclaimed that they were the long awaited Messiah. The Messiah made peace between the waring sides in Israel. The enemies put down their weapons and rhetoric and began to work together. As the internal strife lessened, the Messiah came to the United Nations and proclaimed that a unified Israel would no longer bow to the nations of the world, but would help free the billions of people in the world living under totalitarian regimes, and political slavery. The totalitarian regimes of the world trembled and balked. The President and the Israeli Messiah won the noble peace prize, and then teamed up with the Dalai Lama, Matisyahu, Justin Bieber, Lady Gaga and Madonna to make a huge peace concert in Jerusalem. Seeing that political and social freedom was but a revolution away – the oppressed peoples of the world realized that Israel was not the enemy, but her champion. Their eyes were opened and they saw that America was not the great Satan, but a substantial source of trade, income, and action movies. They rebelled and cast off their totalitarian rulers and elected representative democracies. The Messiah established peace in the world, built a mansion in a unified and peaceful Jerusalem, and played golf with the now former President on occasion. Tour buses of Jewish young Americans now included a stop at the Messiahs house, and returned to campuses and communities that no longer hated Israel or the Jews. And then I woke up and realized it was all a dream. In the course of one week in Greater LA, Matisyahu will play three shows, Yemen Blues at least two shows, and Idan Raichel three shows. Turns out that three of the biggest Jewish artists, a Hebrew Trifecta, will be performing on the same night, Thursday, Nov. 4th — Matisyahu in Ventura, Idan in the Valley, and Yemen at the Skirball. And each show will be packed to capacity. Lastly, let’s not forget the Afro-pop sound of Fools Gold, led by two Israeli-Americans who sing in Hebrew, headliners at Jewlicious Festival in February, who played tonight at the Greek. Matisyahu’s show Wednesday night in LA featured cameos by Ravid Kahalani, the leader of Yemen Blues, and Yehuda Solomon, lead singer and co-founder of the Israeli band Moshav, who are now based in LA. All in LA, chabibi. And all the same week. The rumors of the death of Jewish music are just fiction, and the music plays on. The crowds live on. The creative essence of Jewish peoplehood lives on. The crowd Wednesday night was part Birthright reunion, part downtown LA, part hipster and part gangster, unity and diversity. Hundreds of Jews of all ages packed into the club to see the most famous orthodox Jew in the world today. Dancing, singing, and swinging his peyos at one point, Matisyahu was the convener. It’s good to see that the music has not died, that Jewish organizations and popular venues are able to book shows which speak to our youth just fine. Advertisement on side of truck circulating near circus in LA. Elephants, tigers, bears and other animals are used for entertainment in circuses. Extravagant animal acts at the circus seem like an age-old tradition that has been part of the fabric of society for eons. The circus is a rite of passage of childhood. But are they Kosher? I hadn’t considered too much the moral or Halachic implications of the circus until a recent conversation with animal conservationist Ady Gil. Ady is a world-famous activist who brings a unique person-to-person approach to environmental activism. He believes that the best way to get people to change is through education, to engage them in conversations, show them films, and discuss alternatives with them. From rare eagles in Israel, to whales in the South Pacific, and puppies in North America, Ady is a protector of those without a voice. Ady wasn’t always a prominent, full-time activist. Ady, Israeli by birth, created a very successful niche production company that works on virtually every major awards show on television including The Grammy Awards and The Emmys, as well as talk shows including The Tonight Show with Jay Leno, Dr. Phil and Jimmy Kimmel Live. However, production is not as close to his heart as the animals and so Ady sold most of his business, retiring from the world of show biz, to devote his time and resources to his passion – protecting animals. The bad news about animal use in circuses, Adi explained, is that the animals are frequently subjected to abuse and neglect as they are trained, housed, and transported. If this is the case, the question of whether the circus is “kosher,” or not is not simply academic. Circuses may be transgressing the Jewish edict of tzaar ba’alei chaim, the commandment to avoid inflicting gratuitous pain on animals. If circuses are not “kosher” what can be done? Adi believes that one of the ways we can do something about the fate of these animals is simply to not support circuses that have animal acts. While this may sound like a bummer, most kids would be upset if they learned that animals can be mistreated as part of the training and performance regimen. The use of animals for the circus is certainly unnecessary to create a marvelous experience. Consider that the most popular circus company in the world, CIrque Du Soleil, creates memorable, incredible circus performances without the use of live animals. Why is this issue pressing now for Adi? The main purveyor of these acts today, the Ringling Brothers and Barnum and Bailey Circus, are performing now at the Honda Center in Anaheim and then in Ontario and Bakersfield, over the next weeks. If you think that these circuses are not “kosher” you may want to consider another family activity. Adi’s points out that without an audience, animal-centered circuses will not be profitable, and they will forgo these acts or fold altogether. In addition, there are animal groups that adopt unwanted circus animals. And keep your eyes open — Adi has purchased billboards and even driven mobile advertising trucks he created in order to educate the public about the circus. http://rabbiyonah.com/wp-content/uploads/2013/04/cropped-RabbiYonahbookCover11.jpg 0 0 rabbiyonah http://rabbiyonah.com/wp-content/uploads/2013/04/cropped-RabbiYonahbookCover11.jpg rabbiyonah2011-08-03 05:37:322011-08-03 05:37:32Is The Circus Kosher?